Motorcycling nirvana is closer than you think! Unlimited speed limits, hairpin turns, high alpine meadows, picturesque villages, cascading waterfalls, miles of windy mountain roads – all are available in abundant supply in Germany and Austria. Somewhat unexpected was the traffic, sometimes miles (or should I say kilometers) of it! Even in the Alps, there was traffic. Granted we were there in July, one of the busiest months for tourists. But it was all worthwhile as we bathed in the awe-inspiring glory of the mountains and valleys. 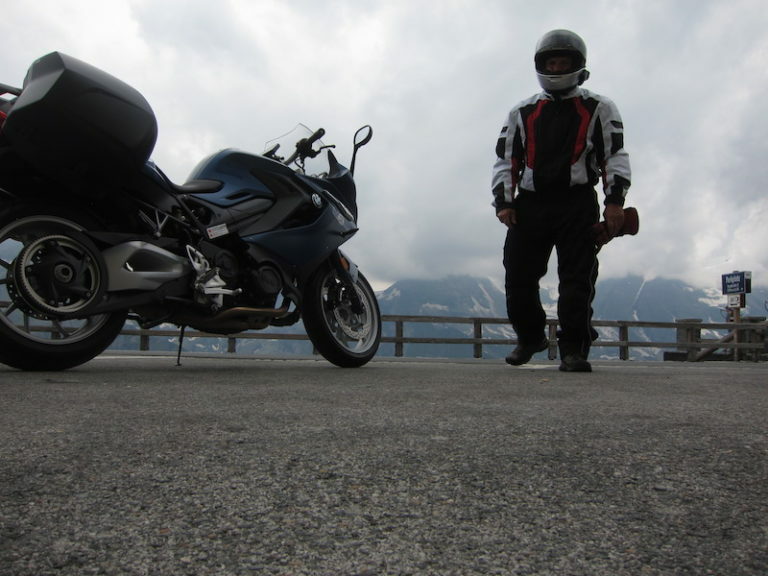 The Austrian Alps are pure joy for a motorcyclist! It truly is like something out of the “Sound of Music” as the hills are alive but the sound is one of motorcycle engines. There is music too, of course. Some of it was encountered in unexpected places, such as the medieval castle in Kaprun, Austria, where we experienced “Burgfest” – a weekend festival of celebrating right out of the middle ages. We heard music made with wood and stone recorders, stringed lutes and bowed lyras (like violins). There was even a Knight Contest, held in the castle keep, where warriors dressed as Knights battled with swords and shields. With their heavy armor on their head, chest, arms and legs, it is hard to imagine how they moved let alone fought each other, yet they did fight and it looked like something out of the ultimate fighter competition! Motorcycles are everywhere, as are bicycles and scooters. Motorists too are aware of the presence of powered two wheel vehicles and even move over when you try to pass them. Lane splitting and filtering is legal and tolerated; motorcycles are expected to move to the front at traffic lights to squirt away from traffic first. In urban centers, bicycles are the easiest way to get around with dedicated bicycle lanes and bicycle crossing signals. Most large cities even have rental bicycles that are left on the street, with cellphone mobile apps that can enable them after paying the requisite fee. 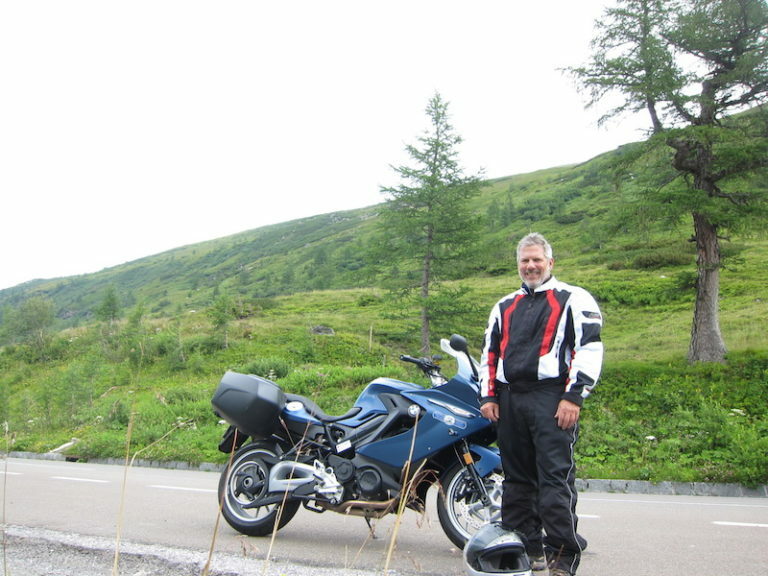 Motorcycles too are easily rented, just make sure to have a international driver’s permit (with motorcycle endorsement) to go along with your state motorcycle license. We rented at Bike-Travel-Service in Munich (see: bike-travel-service for more information). 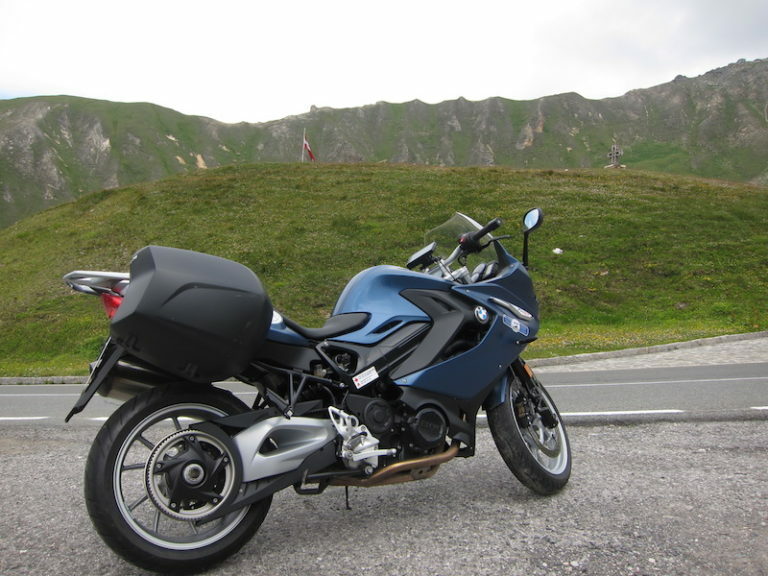 Located at the BMW Motorrad Center on Frankfurter Ring in Munich, over 100 BMW motorcycles are available for rent. 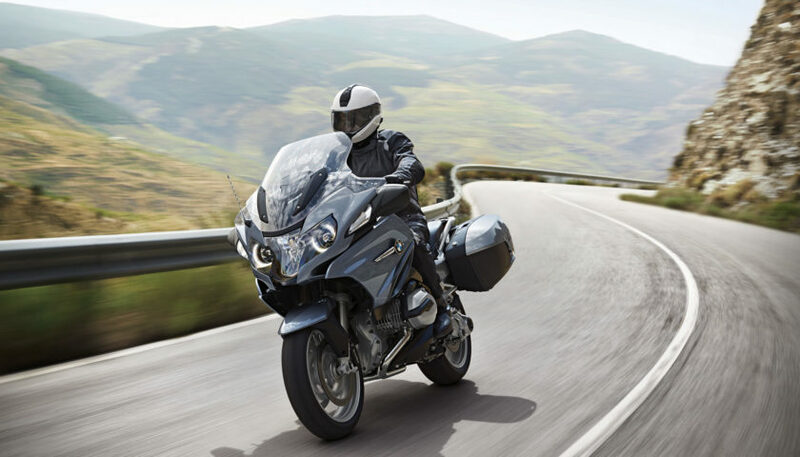 This location holds the largest BMW motorcycle dealer in Europe, with a large inventory of BMW clothing and accessories as well as motorcycles available for sale or rent. Our mounts were supposed to be a BMW F800GT and an F750GS with low seat. The F750GS was not available yet as it was a brand new model so the dealership substituted a F700GS. This was for my wife, Diane, who is 5 foot 3 inches with a short inseam. 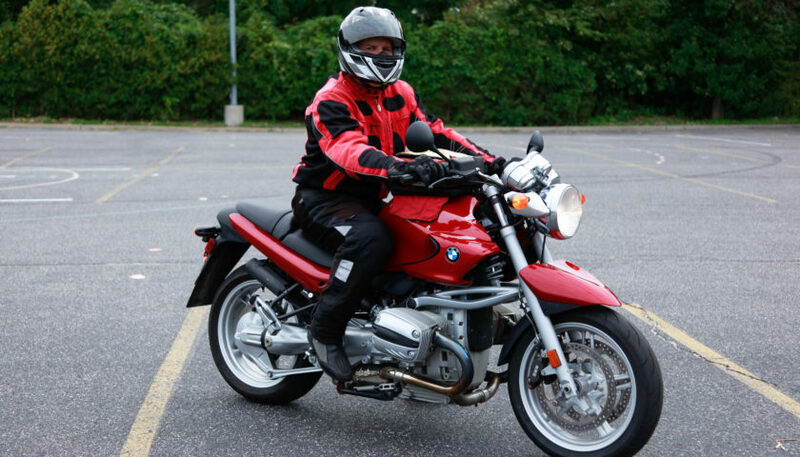 She has a low-seat, low-suspension version of the F700GS in New York, but the rental bike at the dealership was not the low-suspension model and was about 2 inches higher than her personal mount. As it turned out, the F800GT had a low seat and was much lower than the F700GS! As a result, we swapped bikes and were good to go! 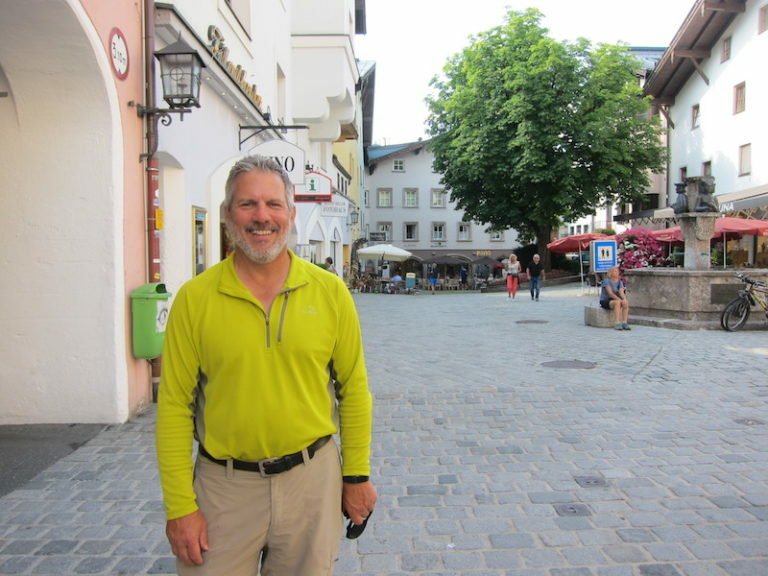 We took back roads from Munich to Kitzbuhel, Austria, a beautiful ski town set in the northern, Austrian Alps. We hit our first alpine pass road on the way, with switchbacks on the way up and over the pass. 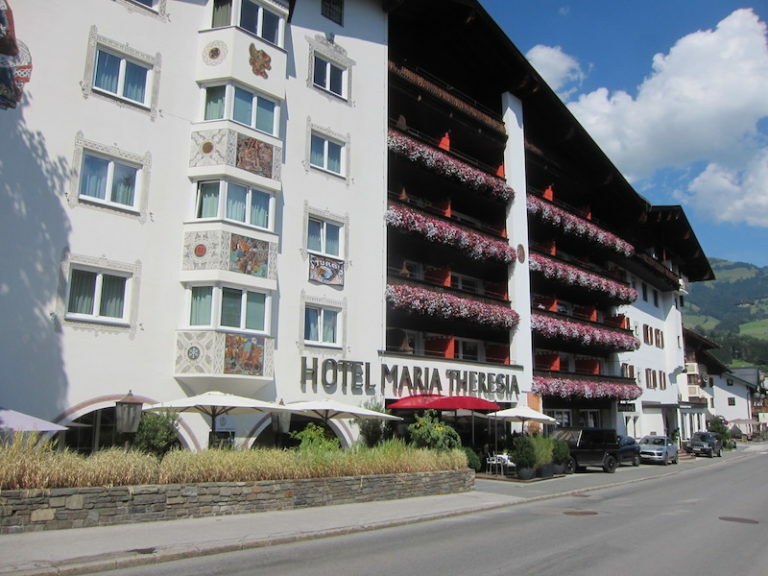 It was a fun ride but we were tired from traveling and were happy to unwind at our hotel, the Q Maria Theresa near the center of Kitzbuhel. As with most small villages, parking near the hotel can sometimes be a problem. Having motorcycles makes the parking situation a lot easier and we parked right on the sidewalk in front of the hotel. After spending a leisurely day in Kitzbuhel, we intended to head out the next morning. Like many hotels and private homes, flower boxes lined the windows. The efficient staff dutifully waters those boxes every morning and when we came out to the bikes, they were wet from the water that dripped down onto the sidewalk from the watering! The hotel provided us with rags to dry off the bikes and we loaded up and were off. Luckily, we rented a GPS with our motorcycle that came preloaded with European maps. We also had the option of entering the German name so that we could actually navigate to a specific location. Please note that German is a language that has additional characters from English, so having that option allows words like “Grossglockner” to be put in with its actual German characters. 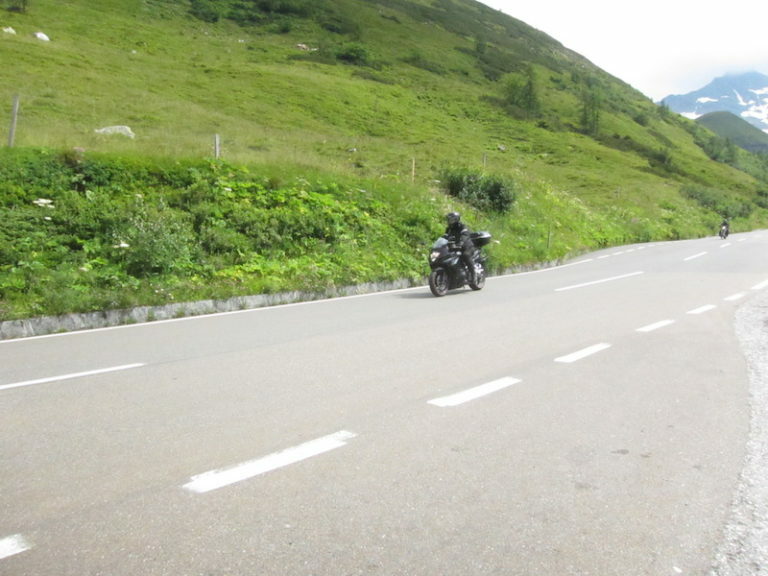 Riding the high alpine road was to be the highlight of my trip and I didn’t want to miss it. So spelling it right made getting there a whole lot easier. We made our way to Zell am See and Kaprun. This valley is not to be missed as it contains a beautiful variety of sites and things to do. Surrounded by Austria’s highest mountains, Kaprun is a city from out of the middle ages. Its castle dates to the early 12th century. Cable cars run to the top of the Kitzsteinhorn, a 3,029 meter (9,937 foot) high peak. If that’s not high enough for you, there are hiking trails that take you to the 3,203 meter (10,508 foot) summit! Also nearby is the Kaprun high alpine reservoir where you can enjoy a look inside the dam wall. You can learn about hydroelectric power generation at the main power station’s information center. Lake Zell is a large, freshwater lake with beaches and boating. It is one of the cleanest swimming lakes in Europe and its fresh water is refreshing in the hot summer sun. Looking for something a little milder? At the Kaprun Museum, you can explore the old history of Kaprun through archaeology, tourism and power plant construction. Exhibition rooms present the history of the Kaprun glacier cable cars. There is also Votter’s “oldtimer” vehicle museum, which contains hundreds of cars and motorcycles from the 1950’s through the 1970’s, as well as older vehicles (tractors and bicycles) plus an 1893 steam locomotive! 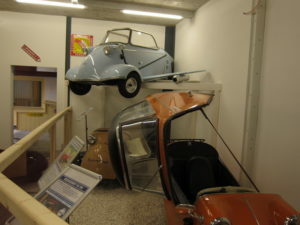 We saw BMW’s, Mercedes, Volkswagens there as well some really unusual vehicles, like a Messerschmitt flying car! See: http://www.oldtimer-museum.at for more information about the Votter’s vehicle museum. While there are many other things to do in the Zell am See and Kaprun region, its easy access to the Grossglockner Hochalpenstrasse (high alpine road) was why we were there. You can drive high up into the mountains to altitudes over 2,571 meters (8,435 feet). The unique part is that the road leads beyond the Pasterze Glacier. Once you reach Kaiser Franz Joseph Hohe, you will be rewarded by a stunning view of Austria’s highest mountain, the Grossglockner. 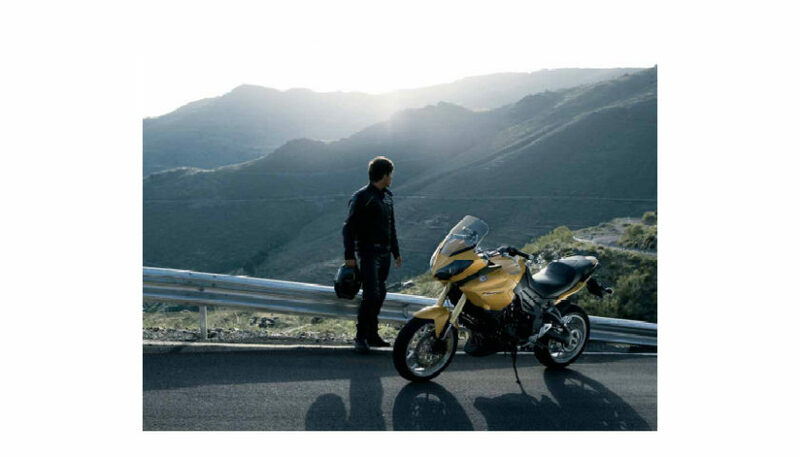 Motorcyclists are attracted to it for its stunning scenery and amazing twists and turns. The hairpin turns are numbered as you ascend the road. Of course, the weather in the mountains is changeable and on any given day you may be treated with sunshine, overcast skies, fog, rain or snow. The road is only open May through November and care should be taken when riding there early or late in the season. Returning to Munich, we thought we’d explore the Autobahn, with its unlimited speed limit in some parts. Unfortunately, we hit heavy rain on the day we road back and we were unable to explore the upper limits of our speedometer. It was just as well as traffic was heavy as we returned to Munich on a Sunday. We did get to try lane splitting, an accepted practice in Europe, when traffic ground to a halt in the busy weekend return traffic back to the city. Unlike the United States and especially New York, drivers in Germany actually move over to allow you to get through! My wife, Diane, who has never lane split in her life actually thought it was fun being able to pass all the cars stopped in the traffic jam. We learned a lot about riding in Europe. In general, Europeans are better, more courteous drivers. Motorcyclists are more skilled as they are required to take extensive driver training and testing prior to getting their license. There is also graduated licensing there, so new riders are not allowed on high powered bikes until they gain more experience. Riders tend to wear full gear and sometimes one piece track suites. There are not many cruisers especially in the Alps as all the roads are windy. The Germans are also more law abiding. Speed limits are rarely exceeded and if so, only by up to 10 kph. There are stiff fines and license suspensions for speeding! There are also speed cameras in many areas and radar signs indicating your speed. City speeds are 50 kph (about 31 mph). Most rural highways are 100 kph (about 62 mph) and the Autobahn is 120 kph (74 mph), 130 kph (81 mph) or unlimited. A sign indicates the speed and a slash through the speed indicates it goes back to the normal speed (100 kph outside city limits). A sign with a name will indicate when you enter a village and the speed limit automatically goes to 50 kph. A sign with a slash over the village name means you are leaving the village and the speed goes back to normal (100 kph) again! You have to know this though as there are sometime not speed limit signs. This can be confusing at times, however, if you have GPS, it will show the proper speed and also let you know if you are speeding by changing your actual speed to RED numbers! Also, unusual is that water is not free. There are virtually no water fountains and you must pay for bottled water. You must also indicate “STILL” if you want normal tap water or you will get water with gas (carbonated). Bathrooms (water closets or WC) are also not free! You normally will pay anywhere from 0.70 to 1 Euro to use the WC. Most restaurants have free toilets but most public areas in large cities require payment. The train system is very good and is the preferred way to travel. High speed trains are common, are quite fast (literally) , clean and relatively inexpensive. Subways (U-bahn or ‘underground’) and suburban train (S-bahn) are cheap, clean and easy to navigate. We took trains in Berlin, Munich, Wittenberg and Leipzig. Airport to city center connections are pretty good in Germany, however, make sure you check if airport access is provided. In Berlin, there is no train connection to the main (Tegel TXL) airport but there is good public bus service. In Munich, suburban train goes right to the airport. We experienced a range of things while in Europe. 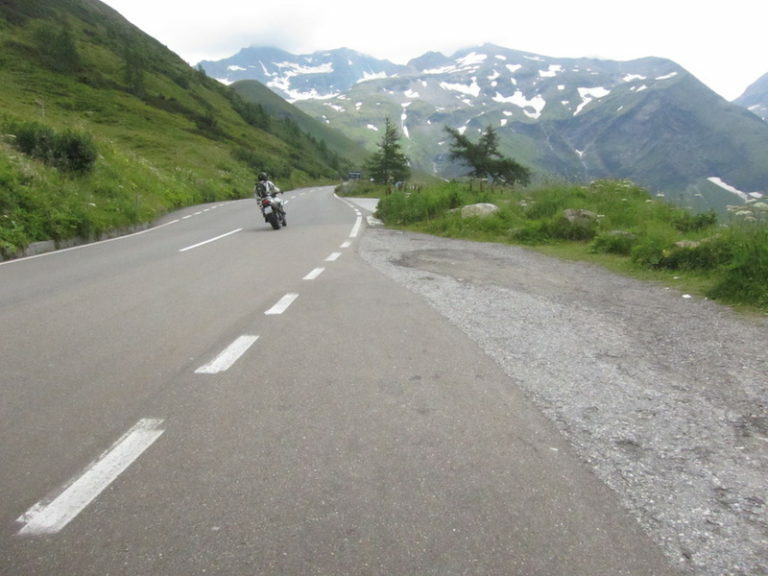 Riding the Alps has always been a dream of mine and one that I’ve now experienced twice. Of course, it is always great to come home especially after traveling for a while. We hope to go back again to experience the other parts of the Alps that we haven’t explored yet. We can certainly highly recommend a summer trip to Germany and Austria. June or early July are probably best as is September. August is holiday time for Europeans and is not recommended. Munich is a great starting point as well. There are rental bikes available there and it is not too far before you will be in the mountains. Munich is also home to the BMW Welt and Museum. A trip there is also rewarding. Try the “premium tour” in English. It is 2 ½ hours long and will take through the museum as well as the manufacturing plant. While only automobiles are manufactured and assembled there, you will learn about the highly automated methods that are used to produce a large number of vehicles with extremely tight quality control. There is a BMW motorcycle manufacturing plant in Berlin that also has tours if you want to see the motorcycle production process. With some much to see and do, you have many options to make your trip fun and memorable. 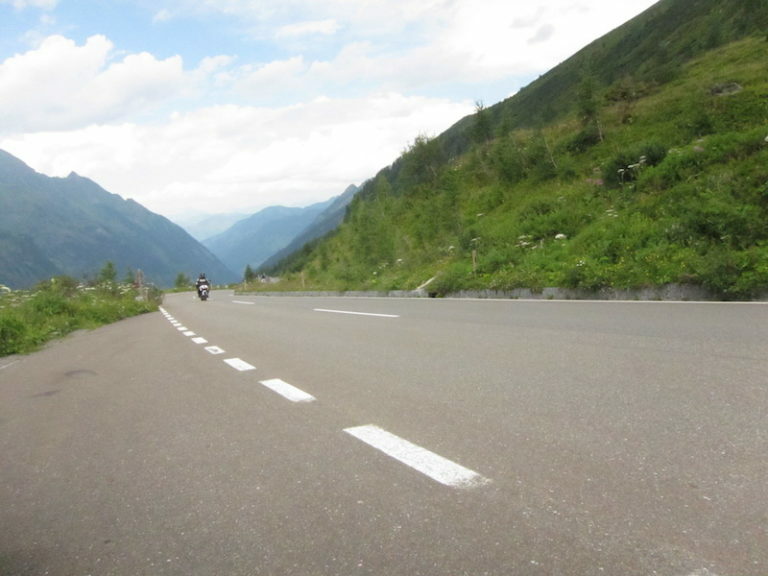 The Alps are the pinnacle of riding for many riders and a trip to Germany and Austria will provide you with the very best that the Alps have to offer.